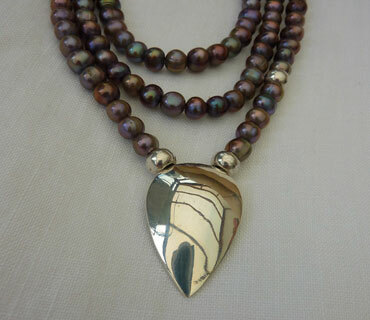 This pendant necklace was commissioned to incorporate the gift of black, freshwater pearls and several silver beads. The pearls are strung on very strong stretch thread and fasten at the back of the pendant with handformed links that are invisible from the front but allow the pendant to sit comfortably in line with the pearls. The string can be worn as a single string or double string necklace or wound around the wrist.